Cool Hand Burg: Wooly Willy would be proud. With all the high-tech defacing of subway ads you see, it's nice to have someone bringing it back to basics. 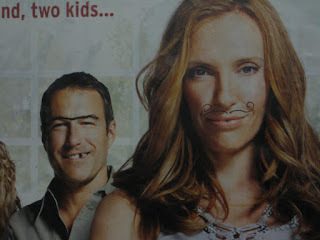 A unibrow, a blacked-out tooth, a circus ringleader mustache....sometimes all you need is a Sharpie.